Together with diamonds, rubies and emeralds, sapphires are classified as one of the four most precious gemstones. 210 sparkling sapphire rondelles in 10 colours – the perfect necklace for summer. Gemstones are currently the dominating trend in jewellery. This sapphire necklace however is not just a fashionable trendy accessory, it is spectacular: In contrast to the blue people normally associate with sapphires, this necklace is very special because it has all the natural sapphire colours. 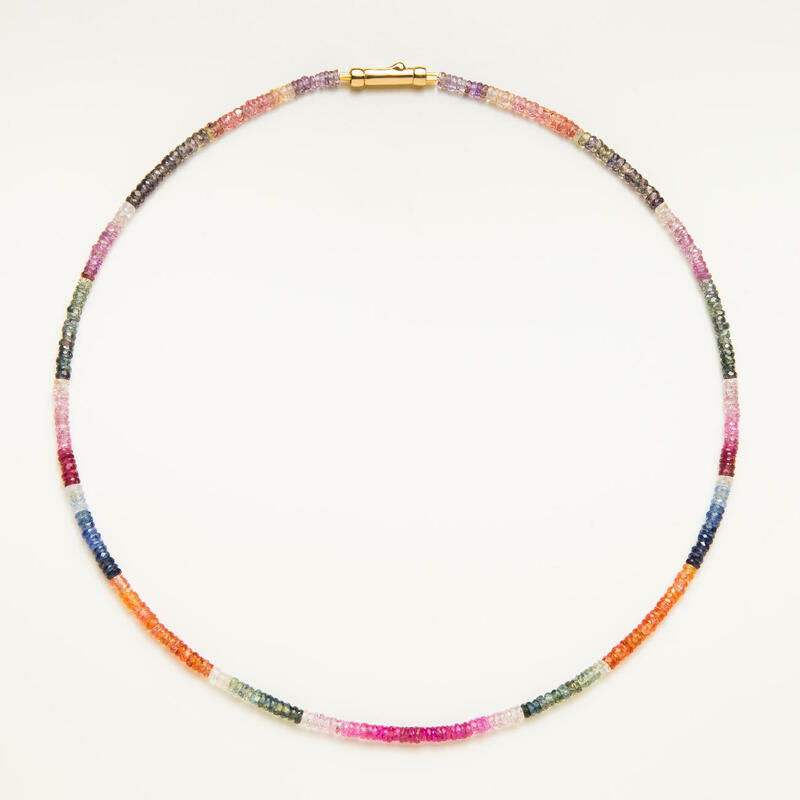 There is no comparison to the many colourful summer necklaces made of dyed stones or even plastic. Sapphires are one of the hardest gemstones (9 on the Mohs scale) - only diamonds (10 on the Mohs scale) are harder. Sapphires can be found in Sri Lanka, India, Myanmar, Thailand and Australia. The colour often tells you something about where the sapphire was found. Sapphire deposits in India are nearly exhausted, and that is why prices for sapphires from this country continue to go up. ... the natural colours of the sapphire, in a combination of various shades, look even more beautiful and get their crystal clear appearance thanks to the faceting of the oval cut rondelle. Weight: approx. 55 to 60ct, 10 to 12g (0.35 to 0.42 oz) without fastening. Length: 44cm (17.3"). With secure bayonette style clasp made of 925 sterling silver with 3 micron gold-plating.